Incredible work yt! It doesn't take you long to accomplish something once you get stuck in to it, does it?! If you're wanting beta testers to try this out on real hardware then I'm more than happy to step forward and offer the services of my mini upright cab in the interests of testing and reporting back potential issues/bugs. I've got a few spare 27c512's and an eprom burner/eraser. It's one thing to see a custom track running in Cannonball or MAME but it would be quite something else to drive a brand new track on the original 1986 hardware! Yes. We should definitely do some hardware testing when the editor is more mature. Most of the time so far has been spent learning the QT framework. And as always a few annoying niggles take longer to solve than they should. The good news is a lot of legwork has been done leaving me to focus on actually building the rest of the editor as opposed to learning tools. On a side note, its possible to represent a trackpath in around 100 bytes as opposed to the 8k or so for each path in the original game. If I was AM2 I would have used a lookup table for the sin and cos. I guess if they'd used a lookup for trackpath sin/cos then the sub cpu program would probably have squeezed into a single 27c512 instead of 4 of them. > Well done to Shawn LeBlanc for naming the editor. Well, they had a bit of space to play with. 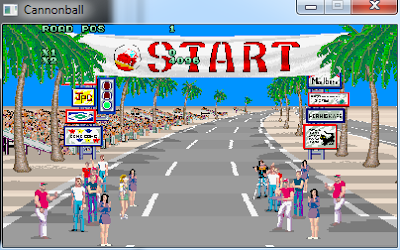 The Rev B romset contains not just the unused prototype track that can be played in Cannonball, but also the alternate Gateway course from the previous Japanese version. Very cool. But I was kind of hoping for a 'live' editor. Was the original a set of beziers? Or does it seem to be free floating? In my opinion, as an artists.. you have to see what the person would see, to be able to really create great levels. Drawing lines on a top view map, just isnt going to be very easy to get good levels down... and a lot of time would have to be spend going in and out of the editor to the tester, over and over and over again. Also, its not just about the feel of the course, and the difficulty... but the look too. And what about 3d object placement.. like the pillar tops on the tunnel level, or the low clouds on the overhanging tree level? What about a split-scree editor? In which you can see the actual game version on one side, and the top view editor on the other? Maybe that live screen, could also be a sprite dropper as well. 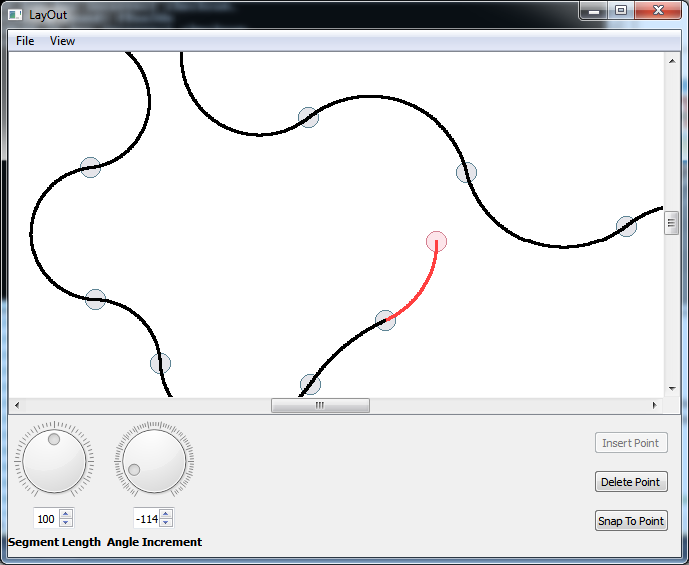 Where you can select an object, and place it anywhere on the screen, at the current coordinate? Are the real games objects sent down the road using a timing system? Or actual 3d coordinates? How are you going to handle hills? Maybe use the live version running at a set speed, and alter controller to adjust as needed? I thought I'd covered the visualization in a previous post, but maybe it was unclear. You would run the editor in one window, Cannonball in another. You click an export option in the editor. 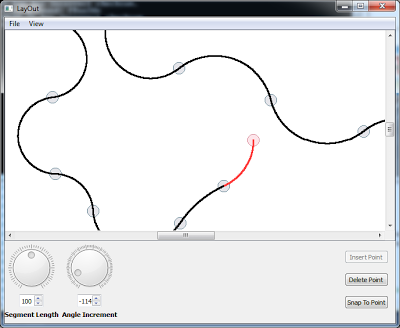 Cannonball is running in a debug mode and immediately displays the track at the point you edited. You can either scroll around the track with the cursor keys, or play it from that point. I'm assuming by live editing, you mean you could almost create the track by driving through it, steering to set direction and pressing some other controls to create the width and hills etc. Although this sounds fun on paper, it wouldn't give you the flexibility you needed in creating the tracks. You would quickly find that creating anything beyond basic was a complete nightmare and took way longer than having a 'proper' GUI based editor. For the objects, they work by defining chunks of sprites, and configuring a specific length of road section to index that chunk with various placement specific properties. You couldn't really just drop a sprite anywhere as you suggested, as the level data you produced would be massive and not fit back in the original ROMs. You would setup the chunks in the editor in a view that was similar to in-game (dragging the sprites around with the mouse) and then apply the chunk to a stretch of road. Maximum hill size: there is no real limitation here, beyond what looks good. I have a plan for creating hills, but will discuss it in a later post. -tunnels (they were there in SMS version)? Road bumps, higher roads, tunnels and similar would require some changes to the core game code not simply changes to the level data. This could be done in Cannonball, but would get messy in terms of bringing it back to the original hardware. For now, I want to focus on levels that work on the original hardware as-is, but who knows what the future holds. Data changes not code/engine changes essentially. With regard to the earlier road intersection question, with the existing level format you can split a road into two lanes, but both both lanes must follow the same core path. You can't, for example, have two simultaneous roads that follow a different path. The raw hardware could support this, but OutRun's engine doesn't. There is lots of weird stuff in terms of the existing level format. For example, you cannot assign a height map and a width change to the same starting position of road.